Just when you thought that the end of summer heralded the start of gloom and ridiculously early Christmas marketing the BOND T4D group comes to the rescue with the quarterly group meeting. Kindly hosted by Mozilla in their London office the meeting focused on questioning whether connectivity was still as much of an issue for technology in development projects as it has been in the past given the current rhetoric (in some areas) of the rise of ubiquitous connectivity. Matt Haikin organised the event and introduced proceedings with some thought-provoking data from the new GSMA mobile connectivity data index – highlighting how, although the global picture looks pretty good when viewed through a lens combining a wide-range of different connectivity indicators, and at first glance seems to backup the story of ‘near ubiqutious connectivity’ that some think is almost with us. Guest speakers – what more can we do? Matt then introduced four guest-speakers to explore what the options are for NGOs working in areas where the generally-available connectivity is not fit for purpose. They discussed work they have been involved in that featured hybrid systems or offline access in an aid/development setting. Michael presented work Psycle had been involved in with the Open University through the TESS-India project using Raspberry Pi to provide offline access to content for teacher educators and teachers within India. Mike explained how BluPoint ‘bring the digital world into non-digital environments enabling the delivery of quality content and services to those unable to access the Internet due to cost, coverage or device capability, using any mobile device they already own.‘ He also touched on the use of TV Whitespace to get connectivity where frequency gaps that exist from the change from digital to analogue are utilised to gain connectivity but you require a licence agreement to run this. Lionel is the European lead for development partnerships at Accenture, and talked us through a number of projects in particular work with AMREF on a project called LEAP health mobile experience ‘and looking at the use of local community access and support that negates the need for connectivity out to the www’. 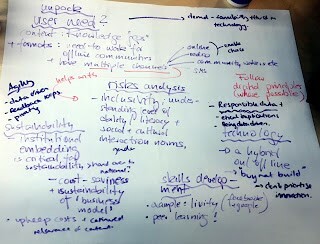 Tony, from the Digital and technology cluster at Institute of Development Studies (IDS) presented some interesting research on an emerging class based framework for viewing connectivity. Encouraging practitioners when thinking about the question of connectivity as a barrier to apply the framework in order to understand better the ways in which having connectivity itself not only introduces but re-enforces or amplifies barriers that already exist. (Stéphane Coillet-Matillon from Kiwix was unable to attend so kindly provided us a video presentation on the topic – unfortunately time-pressures on the day didn’t allow for it to be shown, but it is very interesting and worth a look. 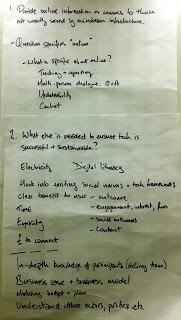 A key theme that seemed to emerge from both the speakers and the discussion that surrounded the presentations was that connectivity was still an issue but that a contextual response to this was not to try and provide connectivity but engage in solutions that were appropriate in seeking to enable agency for those in who the approaches were aimed. 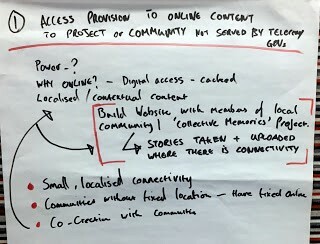 How might you provide access to online information/communications to a project or community that is not yet served by mainstream govt/telco services? 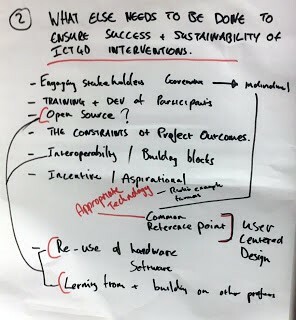 Is this enough – what else do you need to consider/do to ensure it is successful and sustainable? Telcos are not providing what is needed and enabling a more blended approach is key. Some organisations like African Mobile Networks are beginning to put mobile towers in rural towers. Although Smartphones are becoming increasingly cheaper and more accessible users are extremely sensitive to data leakage – another reason why feature phones can sometimes be more popular. Being familiar with and implementing the Digital Design Principles would be a first step in supporting appropriate access and use of T4D. One participant provided a nice example from Colombia on the use of technology to share oral-stories but for the indigenous populations from where the stories came there was no need for connectivity – the medium of engagement stayed the same. But externally for others where connectivity is appropriate the stories could continue to be accessed by a kind of ‘reversed’ connectivity where those within the urban environment could not gain access to content. A few examples of local tools, offline platforms and hybrid systems emerged, and a list of these and other connectivity-related resources is now live, this will be added to over time so PLEASE help us add to this – we know there are a ton of other useful and relevant tools out there! This entry was posted in ICT4D, Technology on October 4, 2017 by matthaikin.